The most lavish commission of King Matthias was a three-volume Bible - perhaps the largest book-project ever started for him. The books and their miniatures were most recently analysed by Dániel Pócs, who states that the model for these commissions are to be found at Central Italian courts: he cites the two-volume Bible of Borso d'Este (Modena, Biblioteca Estense) and the two volume Bible made in Florence for Federigo da Montefeltro (Vatican Libraries). The Florentine books remained unfinished. The first volume, containing the books of Moses, was started by the workshop of Attavante degli Attavanti - only parts of the ornamental title page were executed (see left). The second Old Testament volume remains fully without decoration - but spaces were left our for miniatures. 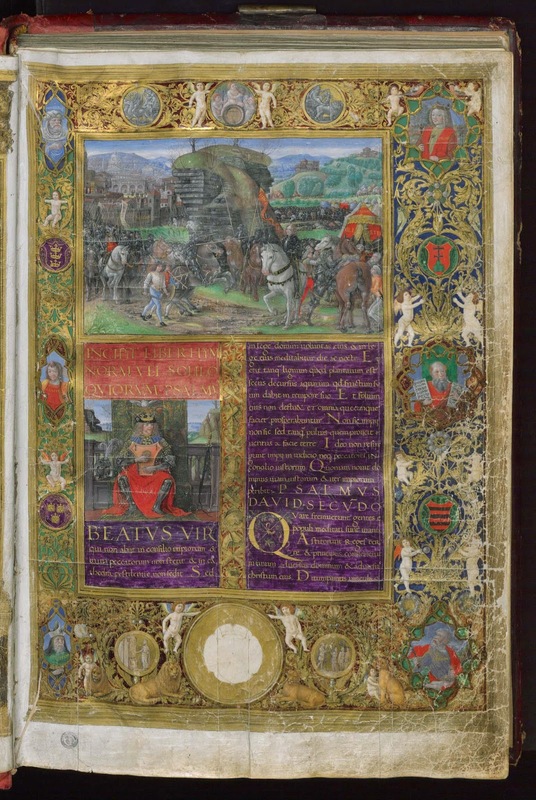 The third volume contains the Psalters as well as the New Testament (it is generally referred to as the Florentine Psalter of King Matthias), and it was to be illuminated by Gherardo and Monte di Giovanni. This process got further ahead than in the case of the other volumes - the magnificient double title page of the volume was finished. 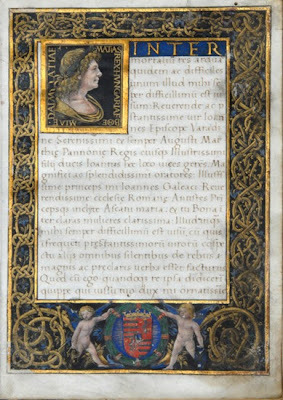 However, the coat of arms of Matthias are missing from the bottom of the page, indicating that work stopped as soon as news about the death of the ruler reached Florence. 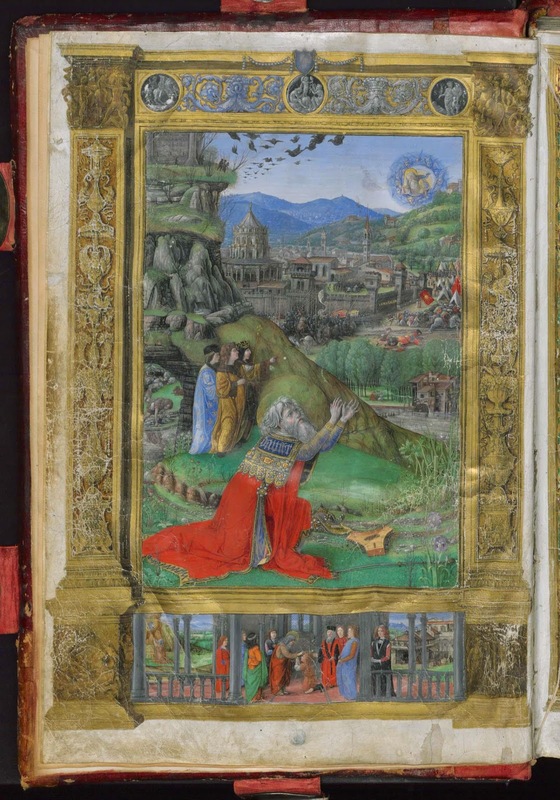 In any case, this double page is one of the absolute highlights of Italian Renaissance illumination. I have also noticed that several Corvinian manuscripts have been incorporated into the World Digital Library, maintained by the Library of Congress. 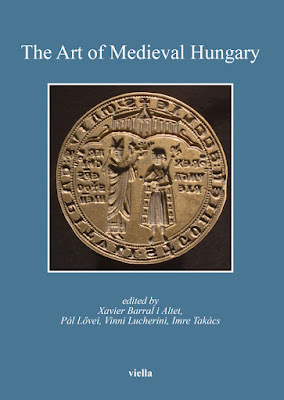 In particular, several volumes from the Laurenziana in Florence and the Bavarian State Library in Munich have been added to this database. The interface of the WDL is very simple and user-friendly, and photos of individual pages can be downloaded. The dataset of Corvinian manuscripts also includes another gem, which I failed to notice before: the Encyclopedia medica or Historia plantarum of the Biblioteca Casanatense in Rome. This is one of three manuscripts known from the Bibliotheca Corviniana which were previously owned by King Wenceslas IV of Bohemia. The manuscript got to Buda via the brother of Wenceslas, King Sigismund. All of the above manuscripts have been added to my checklist of digitised manuscripts from the Bibliotheca Corviniana. The total number of digitised Corvinas now reached almost 120. Previous blog posts about the Bibliotheca Corviniana can be reached on this link. 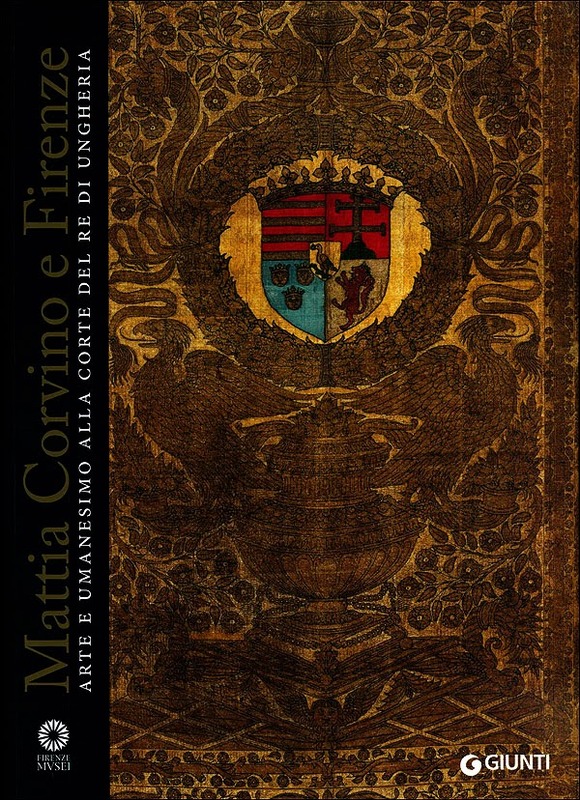 The exhibition Matthias Corvinus and Florence - Art and Humanism at the Court of the King of Hungary is now on view at the Museo di San Marco in Florence (10 October 2013 - 6 January 2014). The 2008 Budapest exhibition dedicated to the same period in the framework of the Renaissance Year, and the conference held in 2007 at Villa I Tatti lead to the idea of an exhibition to be organized in Florence, to show the impact of Florentine Renaissance at the court of King Matthias (1458-1490). The exhibition was jointly organized by the Budapest History Museum and the Museo di San Marco. At this point I can only quote the general presentation of the exhibition from the central website of the project. I plan to come back to the subject once I get a copy of the catalogue. "Using works of art from a broad range of disciplines - painting, sculpture, ceramics and illuminated codices from various museums both in Europe and the United States - the exhibition sets out to illustrate Hungarian Humanism's roots in Italy and the crucial role played by the dissemination of the Florentine Renaissance style in the country's artistic development, a cultural legacy which has continued to underpin Hungarian culture up to the present day. The exhibition reconstructs some of the contacts that played a crucial role in determining the Hungarian court's cultural and artistic choices. Thus it illustrates the trends in the king's taste, setting them against the backdrop of the Florentine context of his time, while also endeavouring, by drawing a number of parallels, to identify the possible influence on those choices exercised by Lorenzo the Magnificent and his entourage of thinkers and artists. 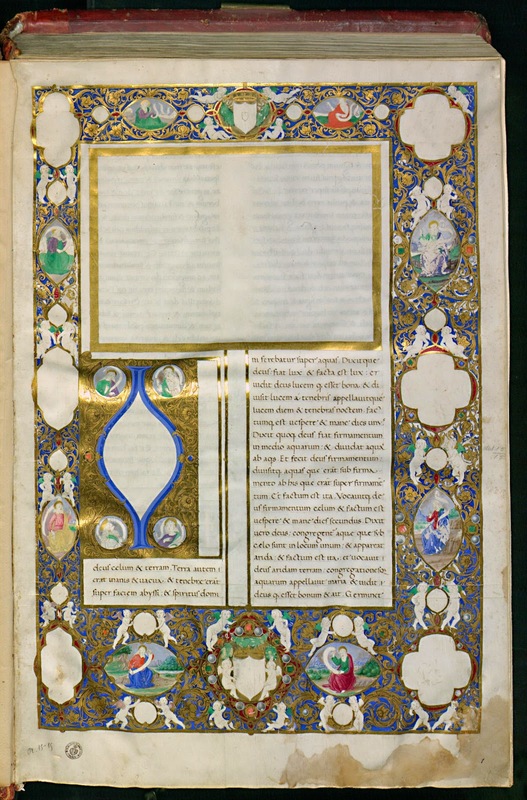 In this context, special attention is devoted to the libraries of Matthias Corvinus and of Lorenzo the Magnificent, and pride of place is given to the precious illuminated codices commissioned by Matthias Corvinus for his library, now sadly dispersed. Some of these manuscripts, which remained unfinished in Florence on Matthias' death, were subsequently purchased by the Medici. Some of the most outstanding loans include Matthias Corvinus' throne tapestry from the Hungarian National Museum in Budapest produced to a design by Antonio del Pollaiolo, a marble relief with the portrait of Alexander the Great from the National Gallery in Washington attributed to Andrea del Verrocchio, Matthias Corvinus' Bible from the Biblioteca Medicea Laurenziana illuminated by Monte and Gherardo di Giovanni, the portraits of Matthias Corvinus and Beatrice of Aragon attributed to Giovanni Dalmata (Ivan Duknović) from the Museum of Fine Arts in Budapest and Marliano's Epithalamium from the Biblioteca Guarnacci in Volterra, with a portrait of Matthias by an illuminator from the circle of Leonardo da Vinci." The exhibition also includes Franceso Laurana's exquisite portrait of Beatrice of Aragon from the Frick Collection. 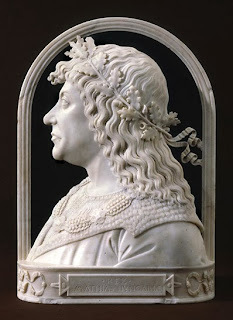 Finally, a few words about the wonderful relief Alexander the Great by Verrocchio, which I selected as the first image for this post. This object best exemplifies the high level of artistic contacts between Florence and Hungary. Giorgio Vasari mentions "two heads of metal, likewise in half-relief; one of Alexander the Great, in profile, and the other a fanciful portrait of Darius; each being a separate work by itself, with variety in the crests, armor, and everything else." He goes on to explain: "Both these heads were sent to Hungary by the elder Lorenzo de'Medici, the Magnificent, to King Matthias Corvinus, together with many other things, as will be told in the proper place." The original bronze reliefs did not survive, but are known from a number of later copies and variants. This indicates that the model of the reliefs was kept at the studio of Verrocchio. 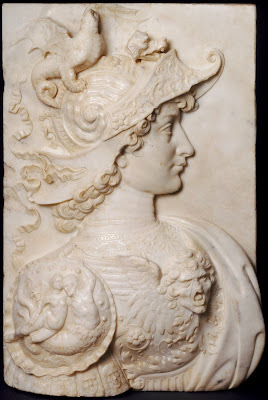 The marble relief in Washington is regarded as one of the most faithful copies. The reliefs were more recently analyzed by Francesco Cagliotti in the Villa I Tatti conference volume on Italy & Hungary in the Renaissance. The full bibliography can be found on the website of the National Gallery of Art. More information on the exhibition can be found on the website of the Museo di San Marco. You can also read about it in The New York Times and in Hungarian daily Népszabadság. A photo gallery of objects on view accompanies the article in La Nazione. The exhibition is accompanied by a catalogue: Mattia Corvino e Firenze. Arte e umanesimo alla corte del re di Ungheria, a cura di Péter Farbaky, Dániel Pócs, Magnolia Scudieri, Lia Brunori, Enikő Spekner, András Végh. Firenze, Giunti, 2013. In this brief post I would like to call attention to two upcoming exhibitions relevant for the art of medieval Hungary. The exhibitions will focus on the two most important rulers of 15th century Hungary: King Sigismund and King Matthias. There is still plenty of time to make plans to see these exhibitions! More information will be posted here as it becomes available. The Museo di San Marco will host an exhibition entitled Matthias Corvinus and Florence. 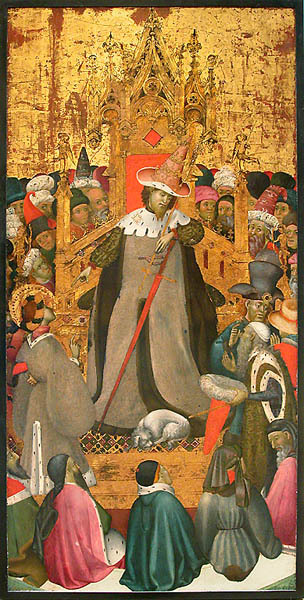 Art and Humanism at the Court of the King of Hungary, focusing on the splendid period of 15th century Humanism at the court of Buda and on the powerful personality of King Matthias Corvinus, a keen lover of books and patron of the arts who was a personal friend of Lorenzo the Magnificent and who sourced his illuminated codices in Florence. The exhibition also investigates the many Florentines who flocked to Hungary, such as the mysterious "fat woodcutter" lampooned by Brunelleschi or mercenary captain Pippo Spano, and helped to strengthen the ties between the two Renaissance centres. 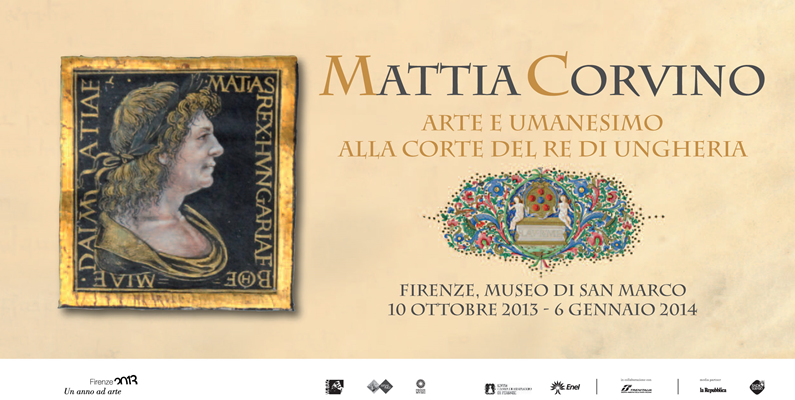 The aim of this exhibition is to develop the theme of the relationship that King Matthias Corvinus established with Florence and its artists, its illuminators and indeed with the entire cultural circle of Lorenzo the Magnificent. The exhibition sets out to reconstruct some of the contacts that played a crucial role in determining the Hungarian court's cultural and artistic choices. Thus it will illustrate the trends in the king's taste, setting them against the backdrop of the Florentine context of his time, while also endeavouring, by drawing a number of parallels, to identify the possible influence on those choices exercised by Lorenzo the Magnificent and his entourage of thinkers and artists. In this context, special attention will be devoted to the libraries of Matthias Corvinus and of Lorenzo the Magnificent, and thus pride of place will be given to the precious illuminated codices commissioned by Matthias Corvinus for his library, now sadly dispersed. The exhibition and the catalogue are curated by Magnolia Scudieri, Lia Brunori, Péter Farbaky, and Dániel Pócs. From 2014 to 2018, the town of Constance celebrates the 600th anniversary of the Council of Constance, and invites Europe to Lake Constance again. The main event of the celebrations will be a Landesaustellung organized by the Badisches Landesmuseum of Karlsruhe and held at the Konzilgebäude (Council building) in Constance - the actual site of the Council meetings 600 years ago. Major works of Western art and civilisation from the time around 1400/20 and from the great museums of Europe will be on view at Constance. The fifteenth-century world event will come to life again, tangible in its historical significance and potency. The key figure of the Council was Sigismund of Luxemburg, King of Hungary and King of the Romans: a brilliant diplomat who managed to keep the entire western world, from the Atlantic Ocean to the Caucasus, together until the Council could be successfully concluded. The exhibition will naturally showcase a number of important works connected to his personality, and will also feature and important selection of objects from Hungary. The project leader of the exhibition is dr. Karin Stober. A website has been set up for the series of events during the next four years, and also for the exhibition itself. In 2012, a number of exhibitions were dedicated to the period around 1400, the period of the International Gothic. Some of these are still open - in fact, one is about to open this week. These exhibitions each focus on one geographical area - but together they demonstrate the richness and variety of this extremely creative period of European art history. When we were preparing the Sigismundus-exhibition of 2006, originally we planned to show some true European highlights of this period - the period when Pisanello, Ghiberti, the young Donatello, Masolino and Massaccio, Claus Sluter, the Limbourg brothers or Robert Campin were all active - but works from this period are simply too fragile and precious to gather in one exhibition. However, if someone gets a chance to visit all the exhibitions listed below, he or she could get a very good impression of the main trends of the period. 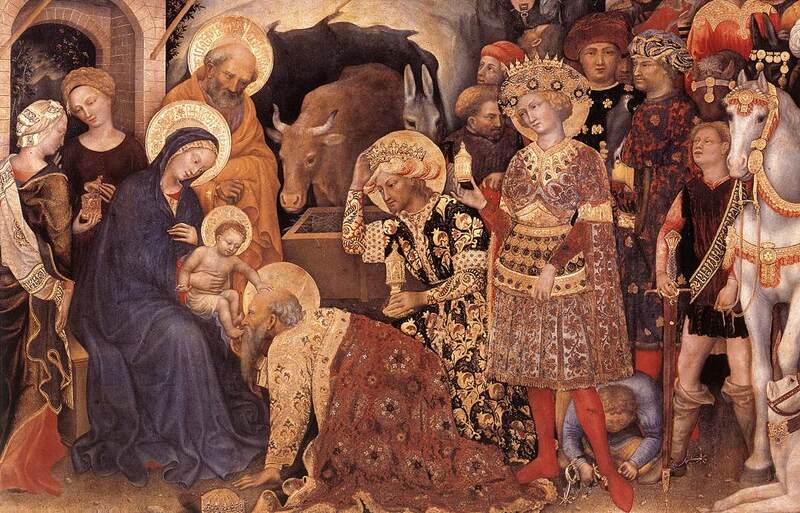 Let us start with the exhibition still on view for a few weeks at The Uffizi in Florence (until November 4). 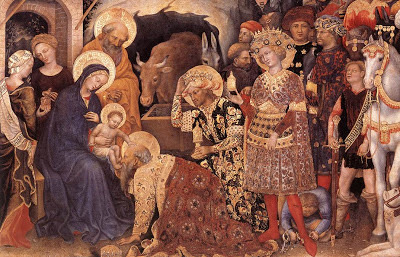 The exhibition titled The Gleam of Gold - The International Gothic Style in Florence, 1375-1440, intends to reconstruct the panorama of Florentine art in the wonderful and crucial period that extended roughly from 1375 to 1440. The exhibition, set out in chronological order, starts with the work of the greatest artists working in the tradition of the late 14th century. Another section focuses on the achievements of Lorenzo Ghiberti, one of the leading players on the Late Gothic scene in Florence who, in the early part of his career, trained virtually all of the city's most important artists in his workshop for the first Baptistry door. The exhibition ends with Paolo Uccello's Battle of San Romano, on display for the first time since its recent restoration. The exhibition is part of the 'Un anno ad arte' series, which has a separate website, with photos of key works on view. You can also read an overview of the exhibition here and in the New York Times. Earlier this year (from 29 March to 15 July 2012), the Museo Nacional d'Art de Catalunya in Barcelona held the exhibition Catalunya 1400 - The International Gothic Style. This was the first major exhibition on one of the most creative cycles in the history of Catalan art, around the turn of the 15th century. Beside great masterpieces by the most important Catalan artists of all time, the exhibition, showed the renewal of the miniature; presented the retable as the distinctive expression of Catalan painting; and it highlighted the importance of the arrival of European artists in Catalonia with the resulting French influence on Catalan culture. One of the stars of the exhibition were undoubtedly the the four panels with narrative scenes from the Retable of Saint George by Bernat Martorell, now in the Louvre. The exhibition includes at the same time a carefully chosen display of sculptures, items of precious metalwork and liturgical textiles. You can get a PDF-format press overview of the exhibition here. The exhibition is accompanied by a catalogue.